Liverpool wrapped up a deal for Alisson late on Thursday evening, with the Reds signing the Brazilian for a world record fee from Roma. The news was confirmed by the club’s official account on Twitter, with Sky Sports stating that the player has moved to Anfield for what is a world-record fee for a goalkeeper. On the club’s official website, the new Reds superstar made a vow to fans following his move from Roma. 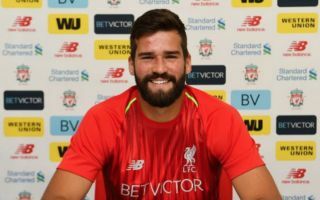 The signing of Alisson was one that is definitely needed by the Reds, as the club have not had a truly world class ‘keeper in their ranks since the days of Spaniard Pepe Reina. Both Simon Mignolet and Loris Karius were average at best for Klopp’s side this season, with the signing of Alisson now set to give all Reds fans some more security and faith at the back ahead the upcoming season. Liverpool are certainly starting to look the part this summer, with the club also bringing in Naby Keita and Fabinho to sure up their midfield options. Who knows, maybe this year may truly be their year….